Let's get one thing straight before we start. I loathe the Daily Mail. It's a hateful, spiteful publication and the world would be a much nicer place if it didn't exist. Damn, that felt good. This article about the death of Stephen Gately has had a lot of coverage over the weekend and generated more than twenty one thousand complaints to the Press Complaints Commission. The thing is, it's not actually that bad, which is why it's still available to view on the Mail website. They know they're on safe ground. 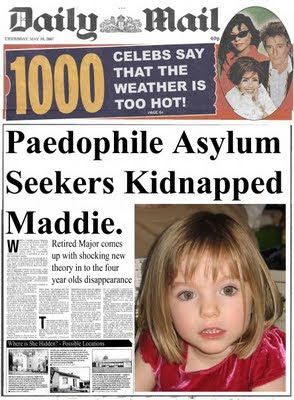 It's insensitive certainly, but that's the Daily Mail - it's usually insensitive. And bigoted. And arrogant. The article is those things too, but this time the Mail has generated twenty one thousand complaints. The Daily Mail doesn't deserve to be censured over Jan Moir's article. A part of me dreams that it will fined an absolute fortune and go bankrupt, never to be seen again, but it wouldn't be fair. The PCC needs to tread carefully and does undertand the problem, because it is currently 'considering' the complaints, rather than announcing an investigation. Unfortunately, a society that has a tradition of freedom of speech and is progressive enough to allow civil partnerships, also has to tolerate the Daily Mail. Bugger.